Here is an interesting interview that I found on jacopastorius.com. “There’s a real rhythm in Florida,” Jaco Pastorius says in a voice saturated in matter-of-fact. “Because of the ocean. There’s something about the Caribbean Ocean, it’s why all that music from down there sounds like that. I can’t explain it, but I know what it is.” He pauses to unclasp his hands, like gangly sandcrabs, and drop his lanky arms to the sides of his lanky body. “I can feel it when I’m there.” The concept of Florida is not a constant among Americans. Some people think of Miami Beach, others warm to the less hectic conjuration of Ft. Lauderdale or sleepy St. Petersburg; for some it is the gateway to the new frontier represented by Cape Canaveral, for others the far older frontier that is the Everglades. Still others revel in the broad paradox of a mecca for retirees on the site of Ponce de Leon’s Fountain of Youth, or the full-circle irony of a land discovered by Spaniards being gradually inundated by the Spanish- speaking. But no one thinks of Florida as a source of American music. No one thinks of it for jazz. 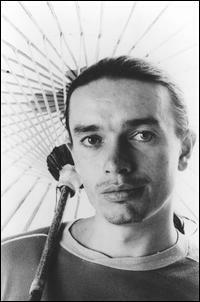 The corresponding hurricane of music that has been unleashed by Florida on a hardly expectant world goes by the unlikely name of Jaco Pastorius, the 25-year-old, man-child of the Caribbean who popped up in early 1976 on a startling debut album of his own design, simultaneously replaced Alphonso Johnson in the fusion music showcase Weather Report whose music he had never listened to before joining the band and at once began to redefine the conception and connotations of the electric bass guitar. Jaco’s playing is nothing less than revolutionary. In fact, he has almost single-handedly opened a heretofore unimagined world of resources for the instrument, forging in ultrasuede sound that at once encompasses the tonal characteristics and phrasing idiosyncrasies of amplified guitar and bass fiddle. In his extraordinary control and imaginative usage of the electric bass’ harmonics alone, he has sketched a stylistic device of sizable potential. His father provided the influence and the example, but there were never any lessons. Jaco developed his unique approaches to both performing and composing completely on his own, based on what he heard. And what he heard consisted mainly of the handful of jazz musicians Ira Sullivan was one of them in the area, as well as the bands and musical shows that toured the state and the Afro-Cuban rhythms that filtered up from the relatively nearby Islands. Jaco relates a story to underscore the importance of his wife and children. “When my daughter was born, I had about $700 saved up to pay for all the hospital bills and all. This was about a month before she was born. And I went out and spent it on an amplifier instead. I needed it; we needed it. Playing was my life, and if I didn’t have a good amp, I realized no one was going to hear me. And by the time she was born, I had already earned about $500 back, working with that amp. It was a decision forced on me by the realities of the situation. “And something happened to me when my daughter was born. I stopped listening to records, reading Down Beat, things like that, because I didn’t have the time anymore. That wasn’t bad that’s why my sound is different. But there was something else. A new personality being born made me see that it was time for my musical personality to be born; there was no need for me to listen to records. I knew music, I had the makings of a musician; now I had to become one. My daughter made me see all this, because she was depending on me. I wasn’t going to let her down.” The sound that Jaco was developing is indeed “different.” In some respects, it is even unique, all the more so since the bass guitar is not an instrument that easily lends itself to a great range of individual expression. At least it didn’t before Jaco, with a few notable exceptions such as Stanley Clarke, Alphonso Johnson, and especially Steve Swallow, whose style is the closest thing to an antecedent that one could find for Jaco’s playing. To begin with, Jaco conceptualizes the instrument as a guitar which, of course, it essentially is. But whereas others have treated the instrument specifically as an electric guitar, Jaco somehow urges the rounded tone and fluidity more commonly associated with the amplified acoustic guitar, the hollow-body instrument favored in mainstream jazz. Very smooth, deeply resonant, Jaco’s tone is a confluence of three important instruments: his left and right hands, and the Fender fretless electric bass. “It sings,” says Jaco in explaining the preference for the fretless instrument. “I’ve been playing it for about six years. It’s all in the hands; in order to get that sound, you have to know exactly where to touch the strings, exactly how much pressure to apply. You have to learn to feel it. And then it just sings.” Jaco’s sound has come to embody a sometimes bewildering array of chord clusters, nearly tangible overtone qualities, swift improvisatory lines that retain a surprising tonal depth and a penchant for using the instrument’s harmonics in both melodic and percussive senses. Quite simply, never has so catholic an imagination been applied to the bass guitar. Still, there is one added dimension to Jaco’s musical persona, as it is conveyed through the bass guitar: Its uncanny ability to sound, in its sonorous tonality and innovative phrasing, as much like an acoustic bass fiddle as it does a guitar. The nature of the instrument is not always clear to even the most experienced listeners. When Weather Report’s Joe Zawinul first heard a tape of “Continuum”, which appears on Jaco’s album, he drank in the velvety richness of Jaco’s bass lead, then turned to the young musician and asked him if he also played the bass guitar. Which, of course, was what Joe had been listening to. Jaco himself can present the clearest analysis of his technique: “I felt that I had never heard anyone clearly outline a tune on the bass. Maybe someone has done it before, I don’t know because I don’t listen to that many records, but I had never heard it before. I had never heard someone take a tune like ‘Donna Lee,’ and play it on the bass without a piano player so that you always could hear the changes as well as the melody. It’s a question of learning to reflect the original chord in just the line. Players like Wayne Shorter, Sonny Rollins, Herbie Hancock, Ira Sullivan can do that. I wanted to be able to do it, too.” Choosing to display this on his record with a dazzlingly fresh version was no accident. Bebop was his self-imposed theory class. “The first jazz record I heard was a Max Roach quarter date,” he says “with Kenny Dorham and Hank Mobley. I don’t even know who the bassist was. The record was old, and shot, and I couldn’t hear the bass player at all. The only thing I could hear was these lines. So I just worked them all out on the bass, without thinking anything of it. And at 15, I already knew how to play most of Bird’s tunes, I couldn’t play them very fast, because of my arm, but I studied them, and I knew how they worked. Just the heads. I didn’t mess with the solos, man; I figured that was personal.” Jaco left the formal educational process after one semester at the University of Miami. He was never enrolled there: he taught bass in the music school. His dissatisfaction with high school “I should’ve quit when I was 10; the schools in Florida didn’t have much to offer” was reflected in his decision not to go to college. Although he had excelled in art as well as music during his high school years, Jaco never had a second thought about which medium to pursue. While at work on the material for his own album, a rousing success that nonetheless only skims the surface of Jaco’s diverse approach to modern music, he again came across Zawinul, who was at work on the new Weather Report album (Black Market). Zawinul was in the midst of recording “Cannonball,” his tribute to the late Julian Adderley who, like Jaco, was an emigrant from Florida. “Joe said he wanted that Florida sound,” says Jaco. “So I recorded that tune, and one other, strictly as a sideman. Alphonso Johnson had already left the band, and even though I didn’t realize it, Joe was auditioning bass players.” They hit it off and, on April l, 1976, Jaco joined Weather Report. Since then, he has consistently been a focal point of the band’s performances, no easy matter in a group boasting Zawinul and Wayne Shorter. His album, which enlisted the talents of Herbie Hancock, Don Alias, Michael Gibbs, Shorter, and Hubert Laws, almost immediately became an underground sensation and an above-ground debut of unusual success. At work on a second album, as well as touring with Weather Report, Jaco’s major problem at this point in time is finding time to spend with his family at his quiet home in Ft. Lauderdale. There he listens to no music, does little if any playing, and keeps in touch with his personal founts of youth and inspiration: his wife, his children, and the mysterious rhythms of the Caribbean.